Built in 1894, St. Mark's church building is an official, historic landmark of San Francisco. The church was renovated and rededicated in 2006, with many of the original details and finishes restored. With its beautiful stained glass windows, refinished interior, and grand Taylor & Boody pipe organ, the Sanctuary makes a lasting impression. The main floor seats 339, the Balcony seats 103. Total capacity = 442. There are 13 pews on each side of the Nave. The center aisle is approximately 60 feet long. Heritage Hall is a gracious, carpeted hall with sash windows and period details. It can comfortably seat 120 people for a sit-down reception, or up to 200 for something less formal. Beer, wine, and champagne are permitted. 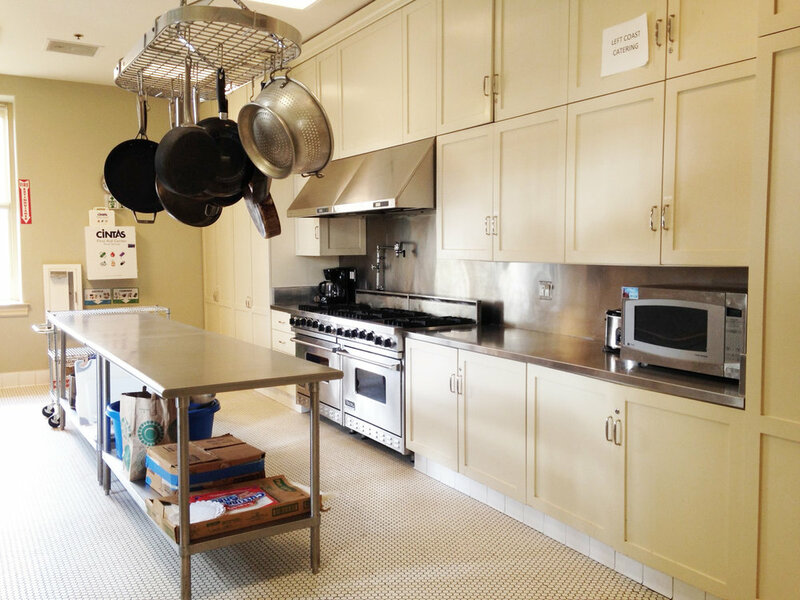 There is a fully-equipped kitchen for use by your caterer. The Fireside Room is suitable for small, intimate gatherings. It can comfortably seat 25-30 people. The Auditorium is suitable for larger receptions. A highly flexible space, it can accommodate sit-down receptions for up to 180 people, or cake/beverage receptions for up to 300. There is space for a dance floor, stage and bar (beer, wine and champagne permitted). A prep kitchen is available. The Conference Room, located on the first floor of the ULC Building, is 15’ x 28’. It can host meetings and gatherings for 15-20 persons. St. Mark’s Square, located adjacent to the church building, is an expansive outdoor space with views of surrounding Cathedral Hill, the red-brick façade of St. Mark’s, bench seating and landscaping. Perfect for casual receptions and gatherings featuring picnic, barbecue or food truck fare, “The Square” is a distinctive venue. If you are interested in renting space at St. Mark's, please contact the Events Administrator at (415) 654-5614.